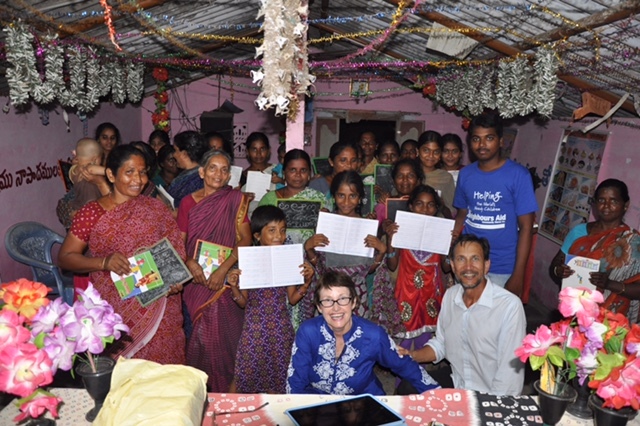 The Tikvah Project [Meaning Hope in Hebrew], involves literacy and health care programs and tailoring schools for poor tribal women and girls in Andra Pradesh. After the women have graduated from the Tailoring Course they are employed by a local clothing factory doing piece work. Orphaned and vulnerable children living with family members or guardians are provided with education and health care in safe loving homes. This initiative is conducted in partnership with Phildelphia Trust, an Indian NGO. The Educare Project, in partnership with Indian NGO Cross Culture, has established a primary school in a Kolkata slum. Medical Camps, wellness and lifestyle courses are offered to the families living in the slums. Neighbours Aid and our in country partners endeavour to assist orphaned and vulnerable children to remain living at home with guardians and family members. Where this is not possible, the children live in safe, caring children’s homes where every opportunity is given for them to remain connected to extended family providing that their personal safety and well being is assured. You can assist us by sponsoring a child in one of these projects. Tax deductible receipts for gifts over $2 with a preference for this approved development project will be issued by Global Development Group for Projects J770. Excess funds may be directed to another approved project activity.